In the catalog of Microsoft Store, there’s been found the official Realtek application for sound setup on systems that use Realtek audio chips. The app is built on the Universal Windows Platform. With the help of Realtek Audio Control, you can set the sound volume for each of the input and output channels, select the devices used by default, and configure the sound effects. Judging by the screenshots and description of the application in Microsoft Store, it is currently still at an early stage of development (not yet ready for use). You can already install and try out the new application; however, this is likely possible only on some supported types of systems. On our test machines, the installation process is completed with an error. If you were able to finish the installation successfully, let us know in the comments section below. 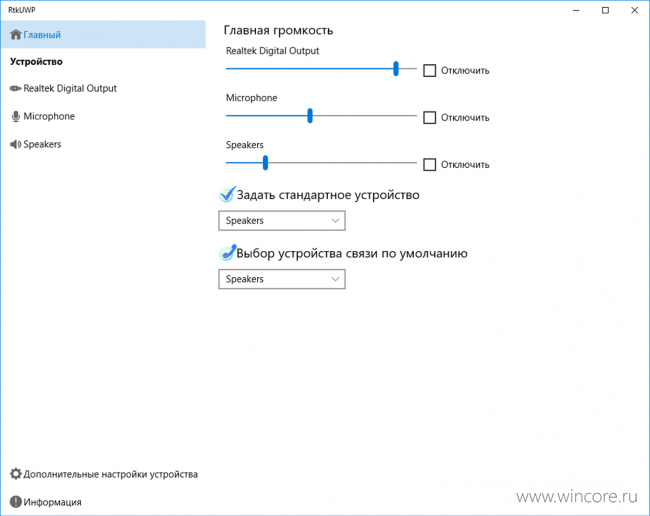 Worth noting, in the latest versions of Windows 10, many users of computers equipped with audio chips Realtek have been facing difficulties when installing or updating drivers. On one of our machines, the driver works just fine, but all the related software (the classic version of the application) won’t start at all. Apparently, Microsoft has once again changed some driver requirements? If you have any information on this issue, we’ll gladly hear you out.